I am developping a JXTA based application in Java with JXSE. 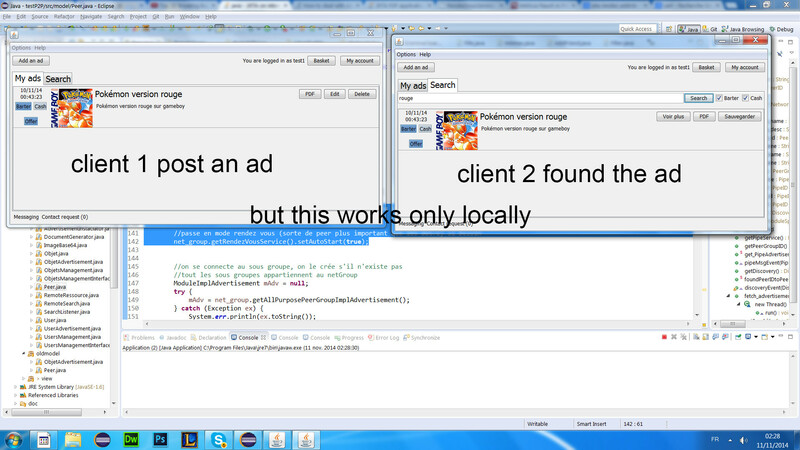 It work very well locally, but now i try to get this work on internet. For exemple, i have 2 computers on a local network. They will find each other immediatly, and the application will work. No problem. Now, i have these 2 computers, and 2 others computers on an other local network. As i understand it, i need, for minimum requierement, 2 public RendezVous peer (one on each local network) that will be connected. But i can't find how to deal with it. In my application, i use the setAutoStart method, that's mean the peer will be promoted to a RendezVous peer automatically if needed. So i think, it's impossible for 2 distant peer to discover each other without give then their public adresse. So i need to retrieve a valid tcp adress on a peer and give it to the others. If someone know how to do that, i will be very happy ! So i would create a addRendezVous(URI uri) or addRendezVous(String uri) that work with net_group.getRendezVousService, but i don't really know how to find the URI or adress ..
1) ensure that the port and IP address are open and available. If you have an antivirus, make sure that the port is opened. Do Let me know, if you have a solution to your problem. Not the answer you're looking for? Browse other questions tagged java desktop-application p2p jxta or ask your own question.